Hear those bells ringing? 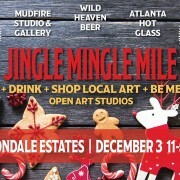 Jingle Mingle Mile is set for December 3rd!!! October 28 – Fri 7-10, October 29 – Sat 7-10, October 30 – Sun 12-5 and Closing Reception Sun 7-10, “Our Cities, Our Souls” ACP show. 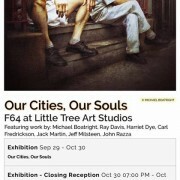 StudioF64 Little Tree Art Studios, 2846 Franklin St., Avondale Estates, GA 30002. 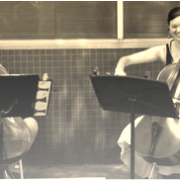 On Nov 13, 2016, 6:00 pm – Celli is teaming up with Banjo Cold Brew Coffee, Island Spiced Bakes & Bites and Little Tree Art Studios for a relaxing evening of coffee, hot chocolate, sweet treats, and Celli to usher in the chilly fall weather. Bundle up in your cozy clothes and bring the whole family- it’s chill time!